The Cleveland Bulldogs won the NFL championship that year with a 7–1–1 record. After winning their first six games, the Bulldogs lost to the Frankford Yellow Jackets and entered a virtual tie with the Chicago Bears for first place in the standings. The Bears played more games, but also had more ties, and their one loss had come in the season opener against the Bulldogs. The Bears attempted to have an after-season exhibition game counted toward the standings, however in 1924 this was against the NFL's rules. In July 1924, NFL owners had agreed on a proposal that the 1924 NFL season would begin on September 27 and end on November 30. Ironically, as it turned out, the proposal was made by Dutch Sternaman, co-owner of the Bears. On the official end date, Cleveland had a 7–1–1 record to Bears' 6–1–4. Ties didn't count at all in those days, so the Bulldogs were in first place with an .875 winning percentage to Chicago's .857. However, on December 7, 1924 the Bulldogs went to Chicago for a challenge match. 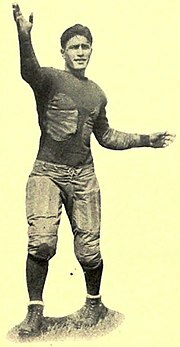 The Bears won the game, 23–0, and claimed that they deserved the NFL championship; they cited as precedent the 1921 championship decision (which the Bears had won over the Buffalo All-Americans) that declared there was no such thing as an exhibition game. However, the issue wasn't settled until the owners' meeting in January, when the owners voted for Cleveland to take the title. The owners also decided at that meeting that the 1925 season would run through December 20.